View of Shevagurry from the top of Ramghurree. bl.uk > Online Gallery Home	> Online exhibitions	> Asia, Pacific and Africa Collections	> View of Shevagurry from the top of Ramghurree. 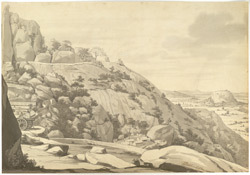 Ink wash of a view of Shevagurry from the top of Ramghurree by Robert Home (1752-1834) in 1792. It is one of a series comprising 22 loose drawings together with a map and three plans completed by Home when he accompanied the British army under Cornwallis during the 3rd Mysore War 1791-1792. The Anglo-Mysore Wars of the late 18th century were fought between the British and the Mysore rulers Haidar Ali (r.1761-1782) and his son Tipu Sultan (r.1782-1799) over the control of Southern India. The Fort at Shevagurry was situated on a large rock in the centre of an extensive forest. It was surrendered to the British in December 1791.